Striped whipsnakes are fairly common in suitable habitats. In California their range is restricted to Great Basin habitats east of the Sierra/Cascade crest from northeastern Siskiyou Co. and Modoc Co. south to the northern Mojave Desert in San Bernardino Co. Absent from higher elevations in the Warner Mountains. Elevation to 2850 m (9400 ft). Important habitats in California include eastside pine, pine-juniper, sagebrush, bitterbrush, and desert scrub. Feeding: A visually oriented, active predator, the striped whipsnake forages on the ground and in the low branches of bushes and small trees. When foraging on the ground whipsnakes often hold their head high off the ground. They are known to take primarily lizards and snakes but also take small mammals, birds, and even insects (Stebbins 1954, Nussbaum et al. 1983). Cover: When not active this species seeks cover under or in dense vegetation, in rocky crevices, or in or around surface objects. During winter individuals hibernate in dens in rocky accumulations (Parker 1976). At other times, whipsnakes may return to these dens if conditions become particularly inclement (Hirth et al. 1969). Reproduction: Males actively search for mates in the vicinity of winter dens soon after emergence in the spring. Eggs are often laid in abandoned mammal burrows. Water: No information on water requirements. A snake of arid lands, permanent water is not thought to be an important habitat element. Pattern: Frequents warm, rocky, brush-covered hills and grasslands. Activity Patterns: An active diurnal snake. Periods of winter inactivity occur at all localities. Seasonal Movements/Migration: Predictable seasonal movements have not been reported for this species in California. In similar habitats in Utah, whipsnakes make annual movements of up to 3.6 km (2.2 mi), or more, to and from known hibernacula (Hirth et al. 1969). 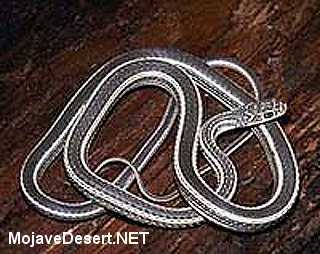 It is probable that striped whipsnakes in California make similar annual migrations. Home Range: Although the exact nature of the home range of striped whipsnakes is not well known, they were found by Hirth et al. (1969) to have larger areas of activity than other snakes with which they occurred. The movements of individuals are somewhat unpredictable. That individuals are capable of relatively Iong-distance movements is evidenced by the recapture of an individual that had traveled a linear distance of 16.8 km (10.4 mi) in five months. Territory: Males are thought to defend a small area around a female during the period of courtship and mating (Bennion and Parker 1976). Territorial defense sometimes involves physical combat. Males are not aggressive toward each other at other seasons or in the absence of females. Reproduction: Courtship, involving the rubbing of portions of the female's body with the head and neck of the male (Bennion and Parker 1976), occurs soon after emergence from the hibernaculum in the spring. Three to 10 eggs are deposited, often in communal nests (Parker and Brown 1972, Nussbaum et al. 1983), in June and July. Hatching occurs in late August or September. Niche: The striped whipsnake is an active, diurnal, visually oriented predator, similar to the California whipsnake, which occurs in less arid habitats. Whipsnakes are taken by a variety of predators including mammals, diurnal birds of prey and other snakes. Bennion, R. S., and W. S. Parker. 1976. Field observations on courtship and aggressive behavior in desert striped whipsnakes, Masticophis t. taeniatus. Herpetologica 32:30-35. Hirth, H. F., R. C. Pendleton, A. C. King, and T. R. Downard. 1969. Dispersal of snakes from a hibernaculum in northwestern Utah. Ecology 50:332-339. Nussbaum, R. A., E. D. Brodie, Jr., and R. M. Storm. 1983. Amphibians and reptiles of the Pacific Northwest. Univ. Press of Idaho. 332pp. Parker. W. S. 1976. Population estimates, age structure, and denning habits of whipsnakes, Masticophis t. taeniatus, in a northern Utah Atriplex-Sarcobatus community. Herpetologica 32:53-57. Parker, W. S. 1982. Masticophis taeniatus. Cat. Am. Amphibians and Reptiles 304.1-304.4. Parker, W. S., and W. S. Brown. 1972. Telemetric study of movements and oviposition of two female Masticophis t. taeniatus. Copeia 1972:892-895. Stebbins, R. C. 1972. California amphibians and reptiles. Univ. California Press, Berkeley. 152pp.his t. taeniatus. Copeia 1972:892-895. Parker, W. S., and W. S. Brown. 1973. Species composition and population changes in two complexes of snake hibernacula in northern Utah. Herpetologica 29:319-326. Schroder, R. C. 1950. Hibernation of blue racers and bull snakes in western Illinois. Nat. Hist. Misc. 75:1-2. Stebbins, R C. 1985. A field guide to western reptiles and amphibians. Houghton Mifflin Company, Boston, Massachusetts. 336 pp. Swain, T. A., and H. M. Smith. 1978. Communal nesting in Coluber constrictor in Colorado (Reptilia: Serpentes). Herpetologica 34:175-177.